The Contract for a short-term holiday rental will be between the Owners of Dunalastair Estate Holiday Cottages (referred to as “us” or “we”) and the person making the booking and all members of the holiday party (referred to as “you”, “your”, “guests”) under the following booking conditions. Scottish law will govern the Contract. The Contract will be subject to these booking conditions, and must be complied with. The person whose name is on the booking form (referred to as the “Responsible Person”) agrees to take full responsibility for ensuring that all the following Terms and Conditions are adhered to by all members of the party. The Responsible Person must personally stay at the accommodation throughout the holiday and be at least 18 years of age at the time of booking. The names, addresses and ages of all members of the party must be shared with the Owners on request. When you submit a booking via our online reservation system you will receive an automatically generated booking summary by email to the email address you provide in the booking form. This does not form a contract between us. A contract shall only arise when your booking is subsequently confirmed by post or email. Cancellations must be immediately notified to us by email. If we are able to re-let your dates we will refund you the final letting price (which may be less than you paid) less an administration fee of £50.00. If we are unable to re-let you remain responsible for the full rental cost and there will be no refund under any circumstances. Cancellation insurance is not compulsory but we strongly recommend such insurance to protect against the cancellation penalty. For your peace of mind we provide the option of refund protection in the booking process on our website. There will be a fee of £25.00 for any transferred booking, and bookings may not be transferred within two months of the visitor's holiday, or from one calendar year to another. A transferred booking is from one property to another or from one date to another. The transfer must also be of equal or greater value. If it is not, no refund of the difference will be made. If for any reason we have to cancel your booking in advance due to circumstances beyond our control for example fire, flood, exceptional weather conditions, epidemics, destruction/damage to the property (“force majeure“) you will be refunded the full amount of the booking. If we have to terminate your holiday early for the above reasons you will be refunded part of the booking fee based on the time remaining of the booking. This will be the full extent of the liability of the Owners. No additional compensation, expenses or costs will be payable. As far as the law allows, Dunalastair Estate Holiday Cottages, its employees and representatives shall not be liable to you or your party for loss, damage or injury to you or any of your party or your/their property or vehicles as a consequence of this agreement or the occupancy following thereon. You indemnify Dunalastair Estate Holiday Cottages against loss, damage or injury sustained to the property or any persons as a result of any breach of these conditions or arising from the fault of you or any member of your party. The website is as accurate as possible but cannot be warranted, nor do the descriptions form any contract. Whilst every effort is made to ensure accuracy of property descriptions and images, the facilities and services may alter. We reserve the right to alter or improve any of the subjects without notice. You may access the property from 16.00 on the day of arrival (earlier arrivals are strictly by arrangement only). Please note that departure is by 10.00 on your final day (again, later departures are strictly by arrangement only). We need this time to ensure that the cottage is ready for your arrival after the previous guests. On departure, you are requested to leave the accommodation in a clean and tidy condition. This includes washing up, dishwasher can be left running, placing rubbish in bin liners and putting in outside wheelie bins, ensuring ovens are clean and free from grease. We reserve the right to make a charge of £35 for extra cleaning if the accommodation is not left in a satisfactory condition. The property is let for the purposes of a holiday let to which section 12 (2) and paragraph 8 of Schedule 4 of the Housing (Scotland) Act 1988 apply. The booking agreement confers the right to occupy the accommodation for the agreed period only. You undertake to use the property solely for its purpose as self-catering accommodation and to accept the Owner’s right to refuse access to the accommodation to any person, whether the Responsible Person or guest of the Responsible Person, deemed unsuitable. Causing a nuisance or disturbance to neighbours or any unreasonable behaviour may result in the Owner requiring the Responsible Person or their guests to leave Dunalastair Estate. Under no circumstances may more than the maximum number of persons stated on the www.dunalastair.com website occupy the property, unless by prior arrangement with the Owners, in which case there will be an additional charge at the Owner’s discretion. We reserve the right to refuse admittance if this condition is not observed. Any persons other than members of your party must not use the facilities at Dunalastair Estate. You are responsible for the property and are expected to take all reasonable care of its furniture, pictures, fittings and effects, in or on the property. You must leave them in the same state of repair and in the same clean and tidy condition at the end of the rental period as at the beginning. You undertake the leave the property secure if left unoccupied during the period of let. You must not use the properties for any dangerous, offensive, noxious, noisy, immoral activities or carry on there any act that may be a nuisance or annoyance to the owner or other neighbouring properties. You are legally bound to reimburse us for replacement, repair or extra cleaning costs on demand (although we would not charge you for the odd glass or plate). If you lose a key we will replace it upon you paying for the cutting of a new one. Internet access is provided for guests’ use in all cottages except Bridge Cottage. You agree to reasonable and lawful usage of this service. In this remote area, internet is not always reliable or fast. We allow dogs, (other pets by arrangement) but only when have they been booked in and paid for. 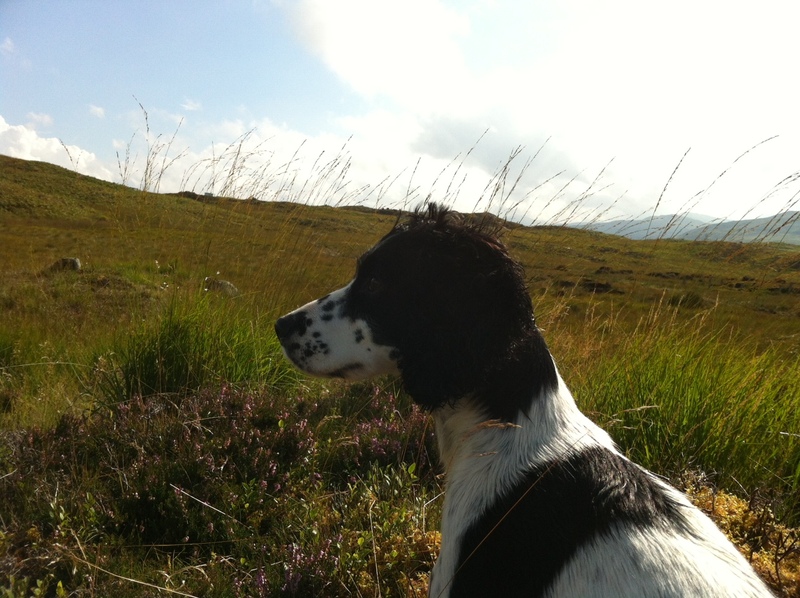 (£16 per dog, per week or part week/per cottage entered). Maximum of 2 dogs per property. Dogs must be house-trained, kept under proper control and not allowed on the furniture, and especially the beds, nor left unattended in the property. Dog hairs are to be removed from carpets and all dog waste collected and disposed of. Dog owners will be held responsible for any damage caused to the property, contents or garden by their dog and for any extra cleaning required. When out walking within the property grounds/estate, you must ensure that dogs are kept on a lead except where indicated. They must not be allowed to disturb livestock, deer or game birds. We reserve the right to seek details of any dogs in advance and to refuse permission for them to be brought to the accommodation for any reason, including if they are considered unsuitable in character, size or behaviour, or liable to be a nuisance or danger to other guests. Free fishing permits are provided for the River Tummel between Kinloch Rannoch and ¼ mile upstream of the bridge at Tummel Bridge (but not below the bridge) for bank fishing and for fishing for trout only from boats on Dunalastair Loch. No bank fishing is permitted by law on Dunalastair Loch but estate boats are available free for cottage guests use on this Loch. Life preservers must be worn. Children must be supervised. Trout fishing season is from March 15th to October 6th. Outside that period, fishing for pike is allowed on the River but not on Dunalastair Loch. Fireworks are not permitted at our cottages without written permission due to danger of fire. Every effort is made to ensure that you have an enjoyable stay. However, if you have any problem or cause for complaint, it is essential that you contact us immediately to give us the chance to resolve it. We value your custom and want you to return. We are on site, and will do our best to resolve any problem. In the event that any individual term or clause stated in these Terms and Conditions of Let is not permissible by law, the remainder of the agreement shall remain valid.